It seems almost stereotypical to think of how many young hockey players, several of them from small towns, get their starts on frozen ponds or rivers, hoping to make their dreams of going to the NHL come true. The hope that all of those fun skates with friends and family members could amount to something great in the future. Emīls Potāpovs is one of those players who has enjoyed several skates on a frozen river, hoping to make his dream of professional hockey become a reality. He may not be in North America yet but, just like when one begins to learn skating, he is taking small strides on his way to fulfilling his life’s passion. Emīls Potāpovs was born on May 3, 1994, in Riga, Latvia, but he has lived most of his life in Ogre, a town 40 minutes away. Hockey was already in Potāpovs’ blood from the time he was a young child. His father Lauris has been a fixture on amateur teams in the city and, while he never played professionally, his influence was certainly a positive one on his son. It was the elder Potāpovs who taught Emīls how to skate when he was six years old. As time progressed, the Potāpovs family grew as Emīls’ mother Jolanta, a housewife, gave birth to two other sons; Mikus was born in 1997 and Markuss was born in 2004. In time, they were also taught to skate and play hockey, just like their father and older brother. All three Potāpovs children were taught how to skate on the Daugava River, which freezes just perfectly in the winter for ideal skating. The anticipation for the winter freeze is present every year for the three brothers. When Potāpovs was a young child, hockey in Latvia was starting to become a reputable sport, especially at the NHL level. In 1996, Sandis Ozolinsh became the first Latvian player to win the Stanley Cup, winning with the Colorado Avalanche. By the time Potāpovs started attending primary school, Sergei Zholtok was just starting to find his niche, Artūrs Irbe was becoming one of the league’s better goalies and Kārlis Skrastiņš was just starting his soon-to-be successful career. It was a great turn of events for hockey in the country and it surely boosted the optimism of the country’s ice hockey federation. It seemed like a matter of time before a rink was built in Ogre and, in 2003, one was finally built. To bide his time before he started to play hockey on a more consistent basis, Potāpovs spent three years — from ages 6 to 9 — in martial arts, taken to lessons by his grandmother. As soon as the rink in Ogre was completed, his father asked him and his brother Mikus, who was six years old at the time, if they wanted to start playing hockey. They both said yes and they never looked back. They knew that this was going to become their destinies. It was not known at the time but Potāpovs was about to join a veritable plethora of talented players born in 1994 from Latvia. Coming up and ascending the ranks were players such as Zemgus Girgensons, Teodors Bļugers, Ņikita Jevpalovs, Edgars Kulda, Roberts Lipsbergs, Nikolajs Jeļisejevs, Kristaps Baževičs, Rinards Rosinskis and Ivars Punnenovs. It seemed as though the future of Latvian hockey was getting brighter and brighter. Potāpovs was given the chance to shine, thanks mostly to the coaching of Gunārs Krastiņš, a former professional hockey player in his own right. It was Krastiņš who took Potāpovs under his wing and helped him practice his skills; with this passionate coaching, coupled with admiration of Joe Sakic and Marián Gáborík, Potāpovs feels that the best years of his career have been under his tutelage. For the first two years of his hockey career, he stayed in Ogre, playing on a team that was quite poor. He was playing on two squads, one with players his own age and one with players just a few years older. As time passed, Potāpovs started to do so well that he graduated from the team from Ogre, heading to bigger and better teams in Riga. These players were much stronger than what he was used to but, thankfully, he was incredibly strong considering his smaller stature. This allowed for Potāpovs to thrive in a league that could have been quite difficult for a smaller player. Just as things were looking up for Potāpovs and Latvian hockey as a whole, tragedy struck in 2004. On November 3 of that year, Sergei Zholtok, who had been not feeling well during the last few weeks of his NHL career, collapsed in the dressing room of HK Riga 2000 during a game in Minsk, Belarus. Teammate Darby Hendrickson, who was playing with him on that team and also played with him on the Minnesota Wild, tried to help but it was too late. Zholtok died in Hendrickson’s arms, not even a month before he was to turn 32; his death was ruled as heart failure. His passing sent shockwaves and sadness throughout Latvian hockey and throughout the country as a whole. Potāpovs admits that the tragedy was quite a shock for all to bear, especially since Zholtok was just starting to become of the ambassadors for hockey in the country. The next year, Riga Secondary School #55 was renamed after Zholtok, rechristened as Rīgas Sergeja Žoltoka vidusskolā. Despite the tragic setback, Potāpovs was quickly becoming one of Latvia’s most solid young hockey talents as the years progressed. He started entering several tournaments and he would do well in all of them. He led tournaments in scoring on several occasions, including ones in Turku, Finland, and Zell am See, Austria. At a World Selects tourney, which was held in Riga, he had nine points (five goals, four assists) to lead all scorers. He also did well at a Bauer tournament in Chicago, his first time in North America. By 2009, Potāpovs was ready to take his talents to the higher echelons of junior hockey in Latvia. He knew that, with hard work, maybe he could be like his good friend Zemgus Girgensons, who was already playing in North America. Potāpovs started playing with SK Riga’s under-18 team for the 2009-10 season with such players as Edgars Kulda and Ņikita Jevpalovs. In only 18 games, the then 15-year-old scored 58 points (28 goals, 30 assists), making him one of the team’s top scorers. That year, thanks to his stellar play, as well as solid goaltending from Nils Grīnfogels, SK Riga’s under-18 squad captured their league championship. Potāpovs started gaining significant credibility and praise from coaches around Latvia. Coaches have raved about his solid playing skills, including crisp passes, a good shot, and sharpness and speed from his skating. They also have found that not only is a a good player but also a good person; his attitude is always pleasant and he enjoys playing the game. The next year, 2010-11, Potāpovs was quite busy, playing in three different leagues: the Latvian under-18 league, the Belarusian under-18 league and the second-highest league in Latvia. He played a total of 84 games in those three leagues combined. In 20 games in the Latvian under-18 league, he had 36 points (16 goals, 20 assists) and 30 penalty minutes. In 44 games in the Belarusian under-18 league, Potāpovs shone even more, recording 55 points (27 goals, 28 assists); he also had 66 penalty minutes, which showed that, despite his smaller stature (5’11”, 170 pounds), he was incredibly strong and not willing to let anyone push him around. Finally, in 20 games in the Latvia-2 league, he recorded 23 points (12 goals, 11 assists) and 18 penalty minutes. After the 2010-11 season was over, Potāpovs also got another incredible opportunity. For the first time in his career, he wore the national team jersey for Latvia at the European Youth Olympic Festival, a tournament which was held in Liberec in the Czech Republic. He scored a goal in the three-game tourney. Despite it all, he was not invited to play at the 2011 World Under-18 Hockey Championships, despite the fact that he was one of the highest-scoring players in that age bracket in the country. Overall, the 2010-11 season was not just good for Potāpovs. It was also good for some other 1994-born talents from Latvia. Zemgus Girgensons graduated to the USHL to play for the Dubuque Fighting Saints and, in his first season, he played in that league’s All-Star Game and also won a Clark Cup as league champion. Ņikita Jevpalovs also made his own trip to North America and he signed with the South Muskoka Shield, a team in the independent Greater Metro Junior A Hockey League; as a 17-year-old, he finished third in GMHL scoring with 91 points (48 goals, 43 assists) in 41 games and was named the league’s top rookie. After the summer of 2011 ended, Potāpovs and Latvian hockey suffered yet another tragedy. On September 7, 2011, Kārlis Skrastiņš, the former NHL defenceman who was also the captain of the Latvian national team, was killed in a plane crash with his teammates from the KHL team Lokomotiv Yaroslavl’ on their way to a game in Minsk, Belarus. He was 37 years old. Potāpovs even admits that he cried when Zholtok died but Skrastiņš’ death brought back all the sadness of that day back in 2004. On a professional level, things actually looked up for Potāpovs. He made the significant leap from under-18 hockey to under-20 hockey. He found himself in the MHL’s B league, the second-highest junior league in Russia and the surrounding area. Playing for HK Juniors Riga, Potāpovs appeared in 30 games for the MHL B squad, recording a goal and an assist as an underage player. HK Juniors Riga also had a team that moonlighted in the top league in Latvia and he was given the opportunity to play for them, as well. He appeared in 26 games, recording 13 points (seven goals, six assists), quite remarkable for a 17-year-old in such a top league. Yet again, though, despite his obvious talents, Potāpovs was not invited to play for the Latvian under-18 team. Despite everything, Potāpovs was happy yet again to see that many of his friends were also enjoying their own successes. Zemgus Girgensons was named captain of the Dubuque Fighting Saints and he was named to the USHL’s First All-Star Team; he was poised to help the team go far in the playoffs and possibly repeat as Clark Cup champions but he was felled by a broken jaw. Girgensons got the opportunity to make Latvian hockey history when he was chosen 14th overall at the 2012 NHL Entry Draft by the Buffalo Sabres, making him the highest-drafted player ever from that country. Kristaps Baževičs played two games in the WHL with the Prince Albert Raiders before being released, eventually signing with the NAHL’s Alaska Avalanche, showing that his first season in North America was not a complete washout. After a successful senior year at Shattuck St. Mary’s in which he scored 88 points (24 goals, 64 assists) in 51 games, Teodors Bļugers was chosen 52nd overall at the 2012 NHL Entry Draft by the Pittsburgh Penguins; he was later chosen 48th overall by the Oshawa Generals in the 2012 CHL Import Draft but opted out to honour an NCAA commitment to Minnesota State University-Mankato. Despite the fact that he was eligible, Potāpovs was not chosen in the 2012 NHL Entry Draft. 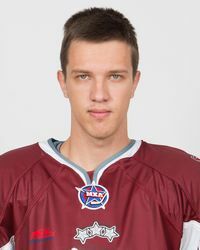 Even though he was considered, Potāpovs was also not chosen in the 2012 CHL Import Draft, which was actually quite successful for Latvia. In addition to Bļugers, four other friends of his were chosen, three by teams in the WHL and one to the QMJHL. Edgars Kulda was chosen 38th overall by the Edmonton Oil Kings; Ņikita Jevpalovs was chosen 40th overall by the Blainville-Boisbriand Armada; Roberts Lipsbergs was chosen 60th overall by the Seattle Thunderbirds; and Rinalds Rosinskis was chosen 65th overall by the Prince George Cougars. Away from the rink, Potāpovs had a personally joyous occurrence. On June 20, 2012, he graduated from Rīgas Tālmācības vidusskolā, one of the best schools for distance education in the entire country of Latvia. Not long after, he enrolled at RISEBA, the Riga International School of Economics and Business Administration, one of Latvia’s best business schools, for his post-secondary education. He will graduate in 2016. During the offseason, Potāpovs thought about where he could emerge playing for the 2012-13 season. He was given some offers in North America, one from the Ontario Hockey Academy, one from a team in the GMHL and one from the WSHL’s Arizona RedHawks. It was a hard decision, especially with the fact that he also had a training camp with HK Riga. This team is in the MHL, the highest junior league in Russia and neighbouring countries. It was tedious at first for Potāpovs, who found himself practicing with rookies despite being older than most of them. It almost appeared as though they were not going to take him onto their roster. After much doing, they finally signed him. It was a good thing, too, because he was about to get another incredible opportunity in his hockey career. In early September, HK Riga took part in the 2012 World Junior Club Cup, which took place in Omsk, Russia. They joined a stacked tournament that included ten teams from several countries. The other teams participating were the OHL’s Sudbury Wolves (the eventual champion); the USHL’s Waterloo Black Hawks; the MHL’s Omskie Yasterby (the host team), HC Energie Karlovy Vary U20 from the Czech Republic, and Dinamo-Shinnik from Belarus; Sweden’s Linköpings HC J20; Finland’s HIFK U20; and the national under-20 teams from Denmark and Norway. Despite the fact that HK Riga upset the Sudbury Wolves in the tournament opener in a shootout, they did not fare so well in the tournament. Through it all, Potāpovs was ever solid and he led the team in scoring. This season, despite going pointless in the first seven games of the year, he is hoping to have a big campaign, including a possible spot on the Latvian under-20 team who managed to avoid relegation and will remain in the top pool for the 2013 tourney, which is to be held in Ufa, Russia. If there is anything that has remained constant with Potāpovs, it is how much he is idolized by two aspiring hockey players who are very dear to his heart: His younger brothers. Mikus is now on a similar path as Emīls, making his Latvian under-18 league début this season with SK Riga, the team his older brother shone with for several seasons before making it all the way to the level he is now. In addition, Mikus is wearing 16, the number his older brother has worn throughout his junior career. Markuss is now playing minor hockey, taking his first steps toward joining his brothers in the same rink in Ogre that they started in, the one that they had to wait to be completed. In a tribute to his idolization of his oldest brother, Markuss is wearing 94, symbolic of Emīls’ birth year. It seems as though things are coming full circle in the Potāpovs family. With the 2012-13 MHL season still in its infancy, there is no telling what the campaign will bring for this budding Latvian talent. That being said, the future of hockey in the middle Baltic nation is starting to look brighter than ever and it is only going to continue. While many thanks can go to several players who are in North America at the present time, it is also possible — nay, definite — that one must also say paldies to Emīls Potāpovs, just another kid who grew up playing hockey with friends and family on a frozen river on the path to fulfilling his dream.